Yaha is a worm with many variants, all based on the original worm, but with some different features added to later versions. Some variants of the worm were created (and possibly continue to be created) in a cyber-war between hackers of India and Pakistan. instructions at the bottom of the message. * Reply to this message with the word "remove" in the subjt line. The worm may also come in another version of the email that looks like a forwarded version of the above email. The worm searches the Windows Address Book, .html files, MSN and .NET messanger cache files for email addresses. It copies the address book from its original location to the Windows directory as www.dll. Yaha stores the email addresses in two files, both also in the Windows directory, named screendback.dll, which stores addresses collected from the address book and screend.dll, which stores email addresses from cache folders. It checks the registry for an SMTP Server, From Address and Display Name, which will be used when sending itself. If it cannot find any, it will use an SMTP Server, From Address and Display Name from a predefined list contained in the worm. Yaha is sometimes also known as Lentin or Valentin, referring to its Valentine screensaver. Several Pakistani government sites, Internet-service providers and the Karachi Stock Exchange were so severely damaged they had to seek help from Western experts to restore and safeguard those sites. Yaha has enough variants to go through the alphabet at least once. 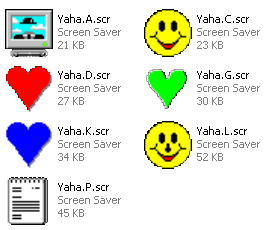 Nearly all variants starting from Yaha.C are able to run automatically without being downloaded and executed by the user. Many variants terminate antivirus and security-related processes. Yaha.K performs a Denial of Service attack on the site infopak.gov.pk. Indian and Pakistani crackers had been engaged in a cyber-war against each other, each side defacing the other's websites. Some observers and even a few from amongst the ranks of the hackers claimed that it had nothing to do with politics (though this did take place during the India-Pakistan standoff), but rather it was simply an unrelated war of "cybercrime supremacy". Many Yaha variants contain messages buried in the worm code that credits the Indian Snakes and the city of Kerala in India. Yaha.B contains the credit "Author : Hirosh", likely the same Hirosh behind an anonymous email-bomber. A few variants launch attacks on Pakistani websites. Yaha and its variants first started making the Top 10 charts in 2002 April. Starting in July 1 of that year, a Yaha variant was in a position to take the number 1 position on the chart, were it not for the fact that it was consistently shut out by some variant of Klez. Yaha.E finally took the number 1 position, overtaking Klez.H. One ISP threatened to deny internet service to users infected with Yaha, who did not get their computers fixed quickly. Yaha.K is destroyed by Gigabyte's worm, Yahasux. Douglas Knowles. Symaqntec Security Response, W32.Yaha.C@mm. Richard A. Elnicki. University of Florida, Virus, Worm & Spam Costs 1: An Episode at the University of Florida.